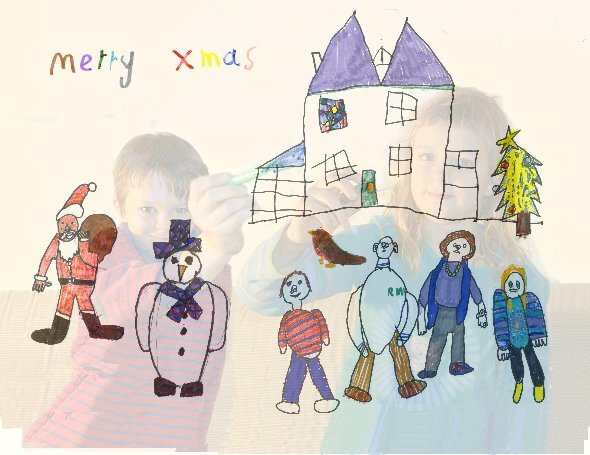 To commemorate our move to our new house, and to give our budding younger artists a turn at Christmas card design, we used the ever-popular device of a children's drawing. We also put Alice & Henry into the picture by layering a semi-transparent image of the children drawing the image as if on a glass pane. The house and family is presumably as they see it - note the double pitched roof and central rooflight and also the stained glass window of our house. 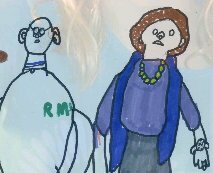 They drew each other, and in the background photograph you'll see that they are wearing the clothes they were drawn in. Henry's picture of Andrew shows him wearing his RMS sweatshirt. Helen's watch is depicted in minute accuracy.